JBF North Bay's Mission: "To positively impact our community so that we may provide a vehicle to support local families to; earn money, stretch their budgets, cloth, educate and entertain their children." We highly encourage you to donate your unsold items! You will receive a tax deductible receipt for your donation. Donated items are distributed to local families here in Sonoma County thru non-profit agencies and hand-to-hand. Remember the Oct. 2017 Nothern CA wildfires? JBF held numerous "freetail" pop up events during and post fires until every last item was donated to those affected by the fires. All 100% run by volunteers! Consignors, YOU have donated TENS OF THOUSANDS of clothing items, books, toys, etc., at a value of over $425,000 to Active 20-30, a 501c3 charitable organization helping children with everyday necessities and other local charities over the years. Shoppers, YOUR admission fees have gone directly to local children through Active 20-30’s annual Children's Shopping Spree event, which takes place each August. This event prepares kids for the start of the school year; new clothes, grade specific school supplies, a new backpack, basics for everyday living, a fresh haircut and more! Thank YOU for being a hero to our community's children in need via YOUR generosity! “One Never Stands so Tall as When Kneeling to Help a Child"
Active 20-30 USA-Canada and Active 20-30 International has inspired millions of diverse, 20-39 year-olds to “Make a Difference,” through volunteerism, fundraising, and acting as positive examples and role models for children in their community. Active 20-30 clubs throughout Sonoma County have been committed to these endeavors since the 1920's and are continually focused on improving the quality of life for our community's children. We invite you to get involved and help build a stronger Sonoma County! 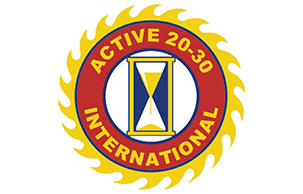 See www.active20-30.org for more information.